Creator John Callahan has been drawing cartoons since he was a teenager. His black humour drawings have been published in over 50 publications worldwide and he has established a long list of admirers for his politically incorrect humour. He targets the disabled and loves the reaction he gets from do-gooders, questioning his morals for targeting this group in particular -even though he has every right to target the disabled as he is a quadriplegic himself. Battling an alcohol addiction, he was involved in a serious car accident at the age of 21 which left him permanently in a wheelchair. So what is Quads!? It is a made for television cartoon series that would perhaps best be described as being in the same genre as The Simpsons and South Park. The humour is closer to South Park, taking far more risks with subject matter, but there are some slight similarities to The Simpsons, not least of all in its quite groundbreaking nature. Although this is the brainchild of Callahan, the production of the series is a joint venture between Australia and Canada. Animation is created by the Perth based company Animation Works, who also produce out of Melbourne. The show is also sponsored by the West Australian Lotteries Commission, giving this an unexpected local feel. The main character of this series is Reilly. He is in his mid-'30s and an alcoholic. One day, while in a drunken stupor, he is hit by a car rendering him a quadriplegic. The driver of the car, Mort, is racked with guilt and buys him a house as a means of settling before Reilly can take him to court. Mort’s wife Liz had suggested the idea, but had no idea that Mort would buy Reilly the house next door. To make matters worse, Reilly asks his friends to come and live in the newly acquired mansion with him. Reilly’s friends are a mixed bunch of losers. His girlfriend Franny is a hemp wearing hippy who simply adores Reilly. The disabled friends include Blazer, a cantankerous head on a skateboard, Griz the Irish drunk, Lefty, a former masseur who now has hooks for hands and Fontaine, the black blind guy with soul. Rounding out the gang are Debbie from the Disabilities Support Centre, Sister Butch, the cause of Reilly’s upbringing, Ricky the lawyer and the wonderful Spalding. Spalding is an Australian Physical Therapist who has quit his job to “make a difference”. To say he is camp would be an understatement and he sets about helping Reilly fix his life. Contained in this two disc set are selected episodes from series one. Episodes featured are Maimed Manor, Christmas Holidaze, Gonad’s Faust, The Son’s Also Blinded, Guinea Pigs, Fatal Distraction and Spalding in the Family Way. Leaving six episodes of series one not included, this could be considered half of the series, but it does feature the pilot and final episodes. The episodes featured may not be the favourites of each individual, but they do give a good indication of the humour and style of this show, so all in all it's a balanced mix. The second series has already been produced and can currently be seen on SBS. Fans of the series will be aware of its crudeness and lack of politically correct content, but that is what makes this show what it is. Those who are yet to discover Quads! may be in for a shock, but it really is worth a look. Being a cartoon series, there is little to find fault with here. It is presented in full frame (so therefore is not 16:9 enhanced) and offers no major nasties. Picture is generally sharp throughout with some terrific and bold colours. Overall this is quite a good quality transfer, doing all that is required. The live footage used in the extras does suffer from grain and the usual video gremlins, but they are all at acceptable levels. The Dolby Digital 2.0 stereo soundtrack provided here is more than adequate. Dialogue is clear at all times and music used is of equal quality. There is little in the way of separation, but it really isn’t required for this type of show. The audio on the extras is also of reasonable quality, but not quite as good as the main feature. There is quite an abundance of extras with this release and most are of decent quality. This featurette with a running time of 26:02 looks at the creator of this series and his life. It is an entertaining and informative inclusion. How Much is That Window in the Doggie? This feature contains one of Callahan’s early cartoon efforts. It is a little sick and runs for 1:03. Director Steve French from Animation Works in Perth discusses every aspect of the company’s involvement in the series. He is interesting to listen to and this featurette offers some great information, with a running time of 9:30. 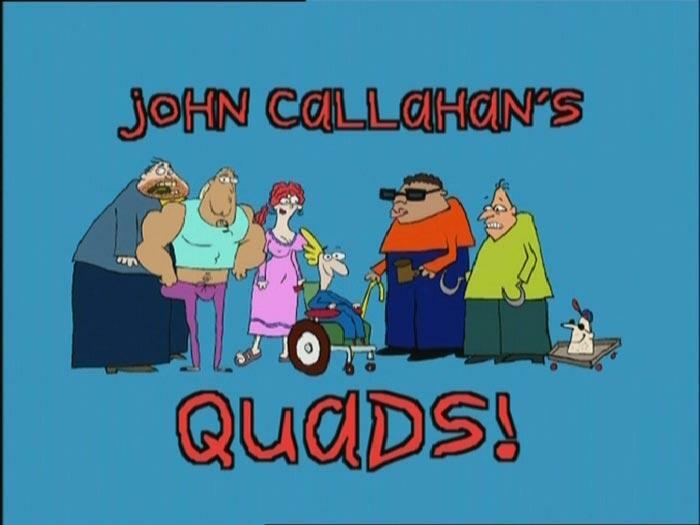 Recorded on the 7th and 8th of June 2001, this interview with John Callahan is a series of responses to interesting questions. It runs for 20:05 and offers some great entertainment and information about the man. Featured here is another cartoon creation from Callahan. This one has a longer running time of 3:58. Making the Music for Quads! A rather lengthy featurette that looks at the creation of the music for the series. It has a running time of 17:35 and offers up some imteresting information. This nicely packaged set is not the complete series, but it's still a great little package. The episodes contained are amusing and the extras are both informative and entertaining. Video and audio are both of very good quality so if you are a fan, this is well worth adding to the collection. 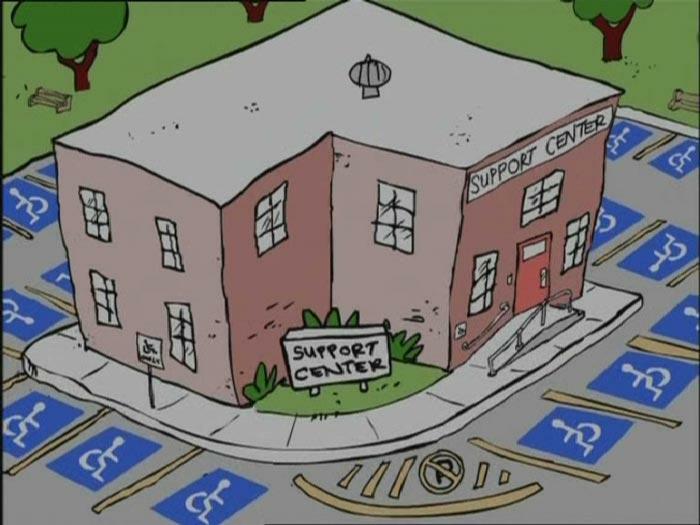 "South Park meets The Simpsons in this creation from cartoonist John Callahan."